This page lists some of the smaller parts and pieces required for installing head-end power (HEP) on a railway passenger car. While these parts are only a some of the HEP products available from Northwest Rail Electric, they are still vital to making a complete HEP installation on a car. These products are built to satisfy all applicable railroad industry requirements for head end equipment, and where applicable have been tested and approved by Amtrak for those upgrading or repairing a car to be approved for use in Amtrak service. Parts from Northwest Rail Electric have been used in converting several hundred privately owned passenger cars throughout North America for use in Amtrak service - as well as being used on a number of less involved HEP installations on tourist railroads that do not need to have full Amtrak HEP. For additional HEP products, please see our List of HEP products, as well as our HEP, COM and MU connectors. We also have a list available of the materials and parts required to convert a railroad car to Amtrak compatible head end power. These cleats hold the wire in place and are made of neoprene to fully grip the wire, while still preventing damage to the insulation and to maximize the longevity of the entire assembly. These are usually mounted under the railroad car and hidden by other equipment and the car structure. These cleats are available in several variations to meet various customer demands. 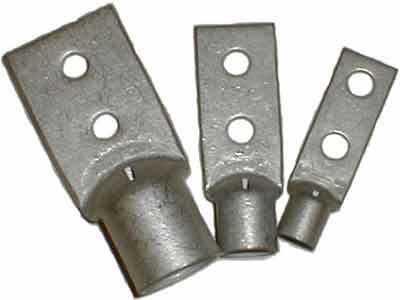 The most common cleat is Northwest Rail Electric Part # 914008, which is the standard cleat for creating an Amtrak compatible car, and has six holes for #4/0 wire, side by side. For each set of cleats, it is necessary to order two cleat clamp plates. In cases where two cleats are stacked it is only necessary to have two cleat clamp plates, but in cases where there is only one cleat you still need two cleat clamp plates. The cleat clamp plates are made of stainless steel, as required in the Amtrak specification for private cars operating in Amtrak service, and fit Northwest Rail Electric Part #914008. The part number for this cleat clamp plate is NW4008C. Please Note that the cleats should not be used above the trucks and that HEP wiring should be put in conduit or otherwise protected in these areas. These kits include enough of our standard neoprene cleats to install HEP on an average passenger car using under-floor mounting. It also includes an Amtrak-approved 480 Volt HEP junction box, HEP Connectors and housings, Amtrak approved splice boots and other hardware. Wire is not included. approved for railroad use in North America. We generally stock all the commonly needed sizes for installing HEP on a car. 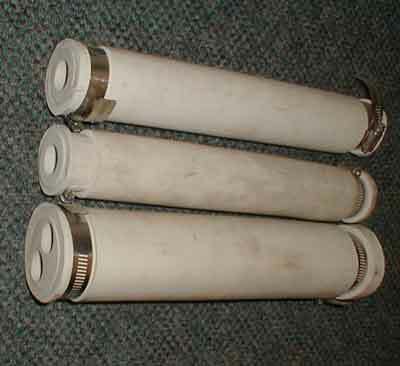 For many HEP electrical connections, these lugs are required for all junctions. We have the exact part numbers that are specified in Amtrak and APTA specifications as they have been proven to survive in the railroad environment. These junction boxes are required for passenger cars that are to be compatible with the Amtrak HEP electrical system. A larger drawing of this box is available by selecting the image below. These plates are used to mount the various HEP connector and receptacle housings. 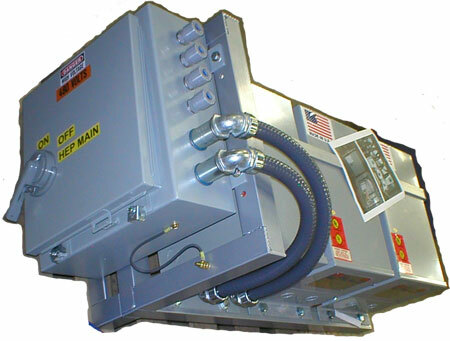 If Communication and/or multiple-unit (MU) connectors are required as part of the HEP conversion, Northwest Rail Electric also offers the mounting boxes that are required. They are available in single and double type. Connections between the HEP train line, HEP connectors, and passenger car taps must be done with these splice boots. If your HEP application demands hardware other than that required by a standard HEP installation, then Northwest Rail Electric will produce custom HEP hardware for your application. For past applications, this has included: custom wire cleats, custom HEP junction boxes, custom HEP mounting plates, and special order HEP receptacle housings. The easiest way to convert a car that was originally built to be entirely 208, 240, 220 or other voltage to compatibility with the North American standard of 480 volts is to install a set of transformers which includes a HEP main breaker. We are distributors for the Clements-National line of HEP power connectors, communications connectors, and MU connectors. The NW-GC500 series is designed for situations where automatic transfer of power sources is desired. 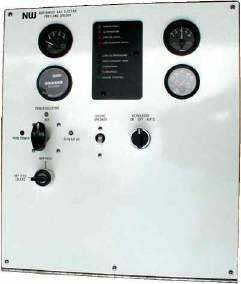 This is used, for example, on passenger cars that have a back-up generator, and automatic start of the generator is desired when the HEP system is disconnected or fails. The NW-GC155 series is designed for dedicated power car systems, where the generator is only used for feeding the HEP line. Available in packages up to 200 kw, the Stadco Railgen series of Generator Sets have been used to power short trains without having to have an additional power car or a locomotive with HEP capability. Smaller capacities may be used as auxiliary power units dedicated to the passenger car on which they are installed. Larger capacities (too large to fit under the floor of a car) are also available for power cars and locomotive use. Evaporator Units and Under-Car Condensers for those converting their railroad air conditioning systems to run on HEP. Yard Power Units are used to power the HEP trainline when a car is in the shop or when a train is laying over at the station. Rubber Tube Diaphragms for those upgrading passenger cars to modern car end standards.